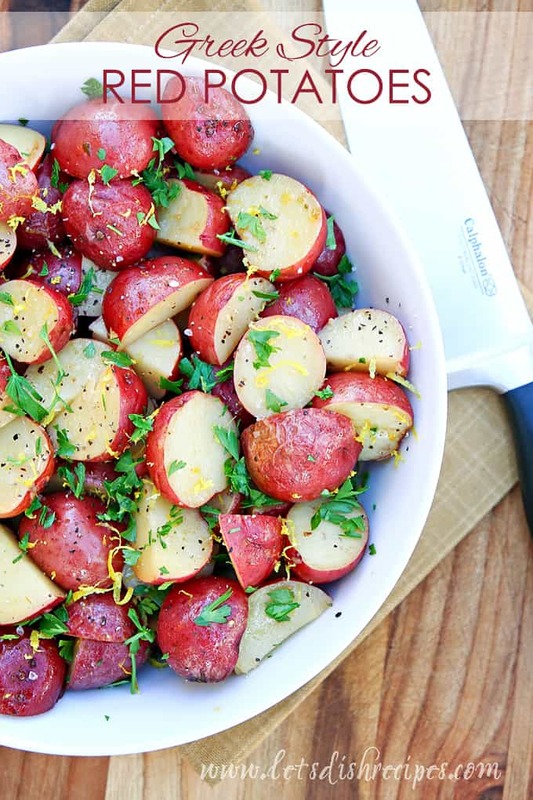 GREEK STYLE RED POTATOES — Chunks of red potato are roasted in lemon juice, olive oil, spices and chicken broth in this flavorful side dish the whole family will love. If I had to choose my most important kitchen tool, it would definitely be a set of good, sharp knives. Good knives are especially important when I’m making a dish that requires a lot of cutting and chopping, like these Greek Style Red Potatoes. To be honest, I’m not the best at running my knives across a sharpening steel after each use, which is why I love my Calphalon Self-Sharpening Cutlery Set. I don’t ever have to worry about my knives being dull when I’m in the middle of making dinner! SharpIN Technology means that ceramic sharpeners are built into the slots of the stainless steel part of the storage block, so every time a knife is removed or replaced, it’s automatically sharpened at the correct angle. Another thing I love about these knives–the ends are labelled, so I can see exactly which knife I need to pull from the storage block. 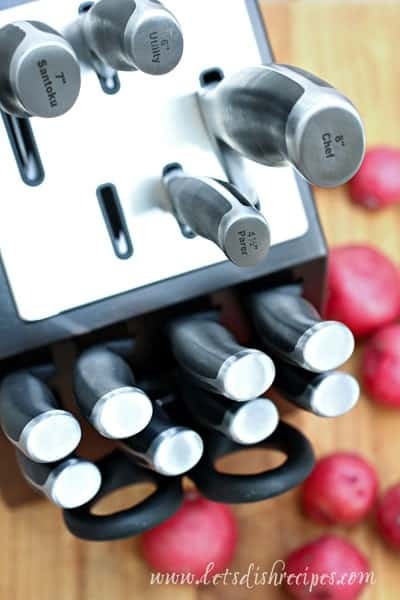 Calphalon self-sharpening knives are made from high-carbon, no stain forged stainless steel. They feature full tang construction and have incredibly comfortable, well-balanced handles, which means they’re a pleasure to use in the kitchen. And they come in a beautiful, maple-stained storage block. I used the 7-inch Santoku knife for cutting the potatoes for my Greek style potato recipe. It’s a great choice for slicing things like potatoes because the dimples in the blade help keep food from sticking to the knife. It’s also a great knife for beginning cooks because it’s a little less intimidating than a classic chef’s knife. 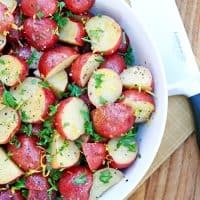 My family loved these Greek Style Red Potatoes. They’re super simple to prepare (even easier with sharp knives!) and go well with almost any meal. 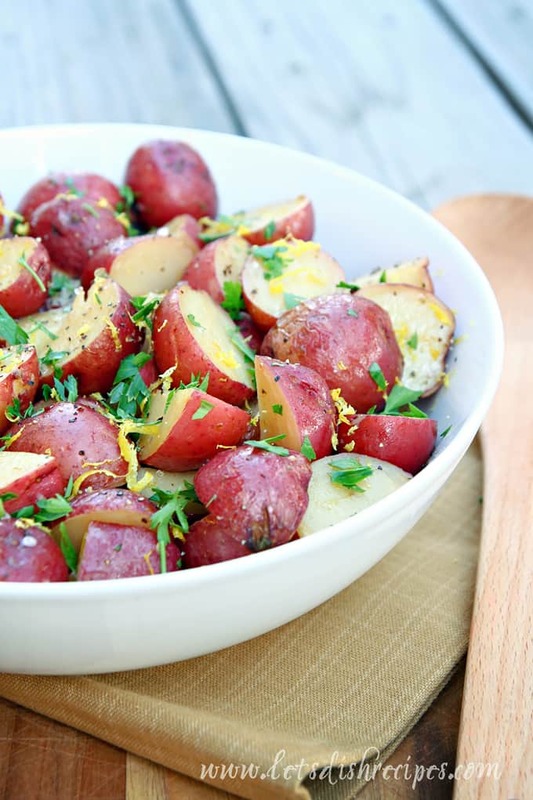 If you prefer, you can use full-size potatoes, cut into wedges. Peeling is optional. 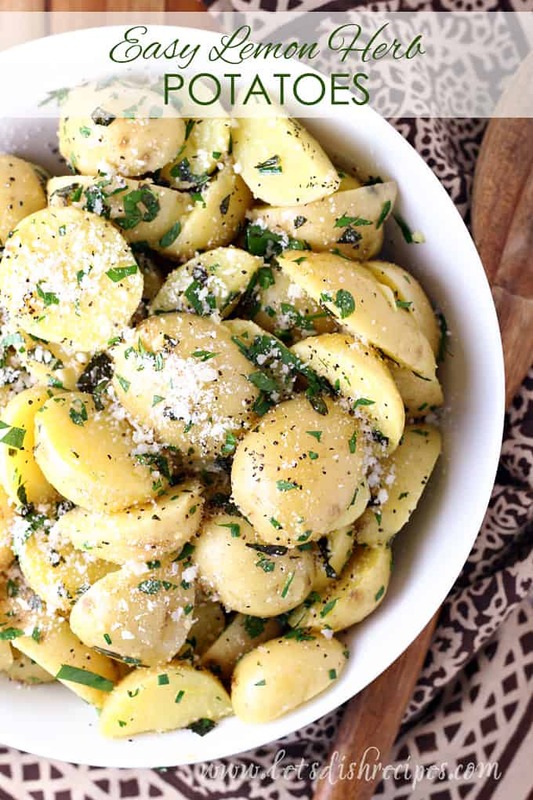 I just love the flavors from the chicken broth, lemon and parsley in these potatoes. I know I’ll be making them again and again! 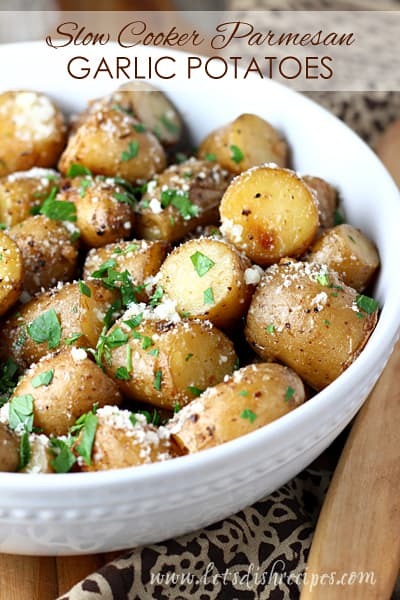 Be sure to save this Greek Style Red Potatoes recipe to your favorite Pinterest board for later. Chunks of red potato are roasted in lemon juice, olive oil, spices and chicken broth in this flavorful side dish the whole family will love. Preheat oven to 400 degrees. Wash potatoes and cut into halves or quarters, depending on size. Zest lemon and set zest aside. Place potatoes in a 9x13 inch baking dish. Add the juice from the zested lemon, olive oil, spices and garlic. Toss potatoes in the pan until well coated with the oil and spices. Pour the chicken broth into on corner of the pan, so as not to rinse the seasonings off the potatoes. Cover and bake for 30-35 minutes. Remove from oven, uncover (keep your foil!) and stir gently. Return potatoes to oven, uncovered, and continue baking for another 30 minutes, or until potatoes are tender. Recover potatoes with the foil and let stand for 10-15 minutes before serving. Your potatoes look delicious! Thank you for the wonderful giveaway. 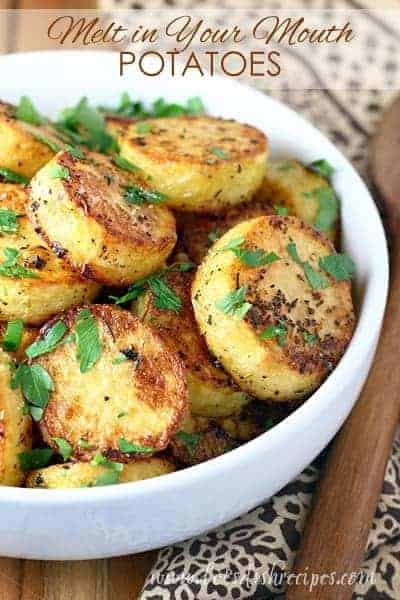 I love potatoes that are roasted, and these look very good! I like the giveaway, too. I hope I win! Also, these photos are beautiful. Miss your face, lady! I love your passion for good food. My family loves everything you have on your website. Your the best ! Ah! I so need new knives/more knives! !